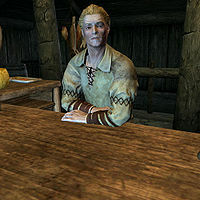 Dagur is the Nord innkeeper of The Frozen Hearth in Winterhold. Haran is his wife, and together they have a daughter, Eirid. While Haran feels less compelled to dig into Ranmir's past, Dagur would like to see the drunk get back on his feet, and for someone to find out what happened to Ranmir's former lover. He wears the standard barkeeper's clothes and a pair of shoes. He wields an iron dagger and carries a selection of common loot and gold. Dagur: "Like some horrible monster was turned inside out, then exploded. What did you do?" He is an attentive barkeep, often asking, "If there's anything you need, just let me know." He is also comfortable with the presence of the college saying, "If you've business with the College, you're welcome to stay here. It's where most of our business comes from, in fact." and "Unlike some folks here in town, we have nothing against the College or the people that come and go." If the Imperials take Winterhold, he won't expect much change saying, "Turns out who runs Winterhold doesn't change much. Can't say I'm surprised." and "I won't complain about Korir being gone, but I don't expect things to really be any different." Lastly, when the town is under siege, he says, "What's going on out there? What happened?" When asked about Winterhold's history, he replies,"I'm afraid there's not much to be said. Winterhold is hardly what it used to be. You can talk to Birna if you need to buy anything. She doesn't have much, but could certainly use the coin. And then there's our little inn. Most of the business we get is from folks here to visit the College, though even that's dried up some." When asked about the college he points you in the right direction saying, "That's right. College of Winterhold, just north of town. Hard to miss." When asked about an elven mage who studies stars, during The Black Star, he tells you, "The mages are up in the College. You can ask them, if they'll let you in. Then again, Nelacar might know. He's an old-timer from the College, but he has a room here." If you ask him if he needs anything done he will ask a more personal favor saying, "Well, not exactly. Listen, we're friends, right? I wondered if I could ask a favor of you." If you say you're not interested he will be disappointed, saying "Ah. Well, some other time, perhaps." If you ask him what he needs help with he will get straight to the point, saying, "It's about Ranmir." If you ask what he was like he will say, "Oh, he was a different person. Happy, outgoing... Like anyone who's in love." If you ask what this has to do with you, he'll say,"Well, I'm getting to that. Just let me explain." When asked what happened to Ranmir he'll explain, "See, Ranmir was involved with a pretty young woman named Isabelle Rolaine. The two of them were very happy together, I thought. One day, she just disappeared. Ranmir was convinced she'd run off with someone else, leaving him behind. He turned to drinking, and what's left of him is what you see here every day." When asked what can be done, he'll give you an open suggestion saying, "I'm not sure. I hoped that maybe if she could be found, if he had some sort of explanation, that maybe he could put himself back together. I'm in no position to go searching for her, but perhaps you could." Dagur: "I understand Korir has been complaining about our customers again." Haran: "What of it? It's our inn, and they cause him no harm." Dagur: "I believe he was suggesting their presence causes him harm." Haran: "Well, then he's welcome to eat and drink at home, isn't he?" Dagur: "Are we running low on mead?" Haran: "No. Even Ranmir can only drink so much." or "No, without Ranmir around we're running out of stock far less often than we used to." Dagur: "Let's just keep an eye on the supply. It's such a chore to restock." Haran: "I suppose that's a benefit to having so few customers." Dagur: "There hasn't been any... problems?" Nelacar: "Are you referring to your other customers? No, everything is quite alright. I expect a little animosity now and then." Dagur: "I see. Well, let me know if things get out of hand"
Nelacar: "I say, you didn't hear any loud noises last night? No, ahh... explosion sounds?" Dagur: "No, I certainly didn't! Is there any reason you're asking me?" Nelacar: "No, certainly not. A small experiment may have gone awry, but clearly with no discernible consequences." Dagur: "I... see. And is this something I need to worry about in the future?" Nelacar: "Oh, I certainly hope not! That would be quite unfortunate for my research." This page was last modified on 28 April 2018, at 20:08.